JJ Flizanes began her professional career as the Foundations Director for the New York Sports Club, where she designed curriculum and in-house certification for new and previously uncertified fitness trainers. She is now an Empowerment Strategist, Director of Invisible Fitness. An accomplished author, JJ has written several books, including The Invisible Fitness Formula: 5 Secrets to Release Weight & End Body Shame, Fit 2 Love: How to Get Physically, Emotionally, and Spiritually Fit to Attract the Love of Your Life and Knack Absolute Abs: Routines for a Fit and Firm Core. She is also contributing author to Inspiration to Realization, and contributing expert for Get Active! Magazine. JJ hosts several podcasts including The Fit 2 Love Podcast, Spirit, Purpose & Energy and Women, Men & Relationships. JJ has created world-class fitness programs and routines, such as the Foundations Program for the New York Sports Club and Invisible Fitness. Named by Elite Traveler Magazine as their 2007 Global Black Book pick of Best Personal Trainer in Los Angeles, JJ has been lauded by Shape magazine as one of the top six fitness trainers in 2003. In 2010 she was chosen by her peers as a finalist for IDEA Personal Trainer of the Year. JJ is certified by the National Academy of Sports Medicine and has also served as Continuing Education Provider. She has lectured for The Learning Annex and as a featured speaker for New York Times bestselling author T. Harv Ecker’s Peak Potentials seminars as well as some corporate clients including Pacific Gas and Electric, Hanson Engineering, and Jostens Inc. She has been featured in many magazines, including, Woman’s Health, Muscle and Fitness HERS, Elegant Bride, Fitness Magazine, and E Pregnancy Magazine. Her television appearances include LA’s KTLA, CBS, and NBC. 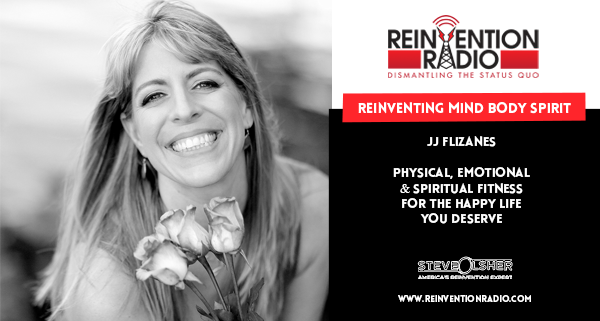 Tune in to hear JJ chat with Steve, Mary, and Richard about reinventing mind, body, and spirit to create physical, emotional and spiritual fitness for the happy life you deserve. Find your true note — what is your why? Reinventing Sales Conversations – In this episode, tune in to hear Sharla Jacobs chat with Steve, Mary and Richard about reinventing sales conversations and attracting new clients through Heartselling.